I read recently about Germain bomber raids to Moscow in 1941. As I understand they were quite massed, but only 1690 bombs dropped on Moscow during several months of bomber raids, several of them - on Kremlin. Was the AA defence of Moscow excellent? Does anybody know the organisation of AA units near Moscow and the amount of AA guns, fighters, searchlights and barrage balloons near Moscow. AFAIK the Russians also used several radars in 1941. I personally don't know for sure, however, if the Russian anti-air defenses were like those in Leningrad, as in an extensive PVO, then I would assume that the air ring was incredibly tight. Not only that, but the Germans were acting from limited, and more or less temporary airfields, unlike in Leningrad where the front was relatively unchanging for three or so years. So, I would assume that the situation for the Luftwaffe was fairly difficult over Moscow, making it easier for Russian gunners in Moscow. The bombing raids on Moscow weren't as massed as they could have been. Winter played an important in grounding much of the Luftflotte assigned to support Army Group North. So many of the raids were delivered in penny packet formations. 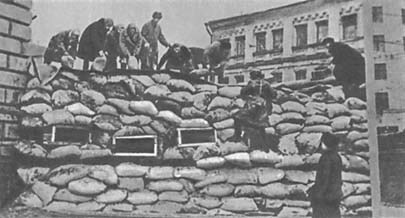 The VVS played a very important part to in the defence of the City and historian Christof Bergstrom suggests that it was the VVS who saved Moscow and forced the Kampfgeschwader to resort to night bombing. Flak was indeed very strong in the City too, the Germans had an abriviation, MMLL, which meant Moscow, Malta, London, Lenningrad. These were targets that the Luftwaffe had a particular distain for as they were very heavily defended. A good book to check out is Bergstroms "Black Cross/Red Star Vol 1" for more info on the subject. The AA artillery was also very numerous: 1,044 AA guns and 336 AA machine-guns. The first Luftwaffe raid on Moscow took place on 21 July 1941 and was carried out by 195 bombers. These were attacked by 170 VVS fighters. 104 tons of high explosives and 46,000 incendiaries were dropped over the city. 6-7 bombers were lost. In the evening of 22 July, 115 Luftwafe bombers attacked the Soviet capital. 5 were lost. The number of aircraft that took part in the raids decreased to a squadron, but until 5 April 1942, the Germans carried out 87 raids. As tonyh recommended, Black Cross/Red Star vol. 1 contains several pages on the subject. Thank you very much for the info, friends! There were almost 200 bombers in the first raid alone. Probably they ment number of bombers that managed to drop bombs over target. As usual little under estimated. was carried out by 195 bombers. These were attacked by 170 VVS fighters. 104 tons of high explosives and 46,000 incendiaries were dropped over the city. 6-7 bombers were lost. It is interesting to note small number of planes germans lost. On the other hand tonnage of bombs is by my opinion a little overestimated. PVO fighter arm's goal was to disrupt bombing raid and force bombers to drop bombs off their target. TISO, that was a night-bombing mission, and in 1941, the Radar-oriented, ground-controlled night fighter tactcs was still in its infancy. According to some German archive sources 7146 airplanes were used during the Battle for Moscow in 1941, only 229 bombers could reach the city during the air raids and dropped the bombs, 200 bombers were shot down near the Moscow in 1941. Russians had several native radar stations near Moscow in 1941. It is interesting that Luftwaffe sent the reconnaissance Ju-86R to the raids over Moscow till the beginning of 1944. Only appearance of the high-altitude (up to 14-14,5 km) modifications of the Russian Yak-9 fighter with turbo-supercharging could stop those raids. What German sources would that be? You already posted yhe info about fighters, so sorry for repeating. 2. Six AA artillery regiments with 548 medium and heavy AA guns (76mm and 85mm) and only 28 light AA guns (25mm and 37mm). 3. One AA MG regiment with 81x4 7,62mm AA MGs. 4. Two AA balloons regiments with 68 balloons. 7. 337th radio battalion with 5 newest radars RUS-1 and RUS-2 "Redut" (range 120 km). Balke U. Der Luftkrieg im Europa. 1989. Balke U. Kampfgeschwader 100 "Wiking". 1981. Dierich W. Kampfgeschwader 55 "Grif". 1975. Gundelach K. Kampfgeschwader "General Wever" 4. 1978. Kiehl H. Kampfgeschwader "Legion Condor" 53. 1983. Piekalkiewicz J. Die Schlacht um Moskau. 1981. I think you are confusing Operation Typhoon with the feeble Luftwaffe bomber offensive on Moscow, which were two different things IMO. Operation Typhoon (October - December 1941) was a major land and air operation, with heavy losses on both sides, while the bomber offensive on Moscow, in late 1941 was carried out by maximum 10-12 bombers/raid and couldn't achieve a number of sorties greater than 7,000. May be you a little bit mistaken also. The first raid directly to Moscow (22 July 1941) - 195 He111s, 6-22 were shot down over Moscow by fighters (different sources). Germans dropped 100 t high-explosive and 45000 fiery bombs directly on Moscow and its suburbs. 23 July 1941 (second raid) - 115-150 He111s (different sources), 24 July 1941 - 100-180 He111s (again different data). Damage of Moscow during the first raid - 1900 fires in the city (several food storehouses and many shops were burned down), explosion of the train with ammunition on the central rail road station; near 300 fiery bombs and 15 high-explosion bombs were dropped on Kremlin. 40-50 Kremlin garrison soldiers and officers were killed during the extinguishing. I found one mention that heavy high-explosion bomb was exploded just near the Kremlin wall, but very thick fortress wall (XV century) was only slightly damaged. The losses of civilians - 23 July 1941: 325 wounded, 31 killed. Many civilians helped fire companies. 24 July 1941 the 500kg bombs destroyed one of the theater, the building of the Soviet Academy of Science. The most destructive air raid was the first (22 July 1941). Total civilian losses in Moscow (only July-August 1941): 736 killed, 3513 wounded. In the majority of the following raids (August-December 1941) Luftwaffe used 10-15 bombers indeed, because of covered movement of small groups of aircrafts, you are right in this case. 31 July 1941 the interesting raid was performed - only 7 bombers attacked Moscow not from the North-West or South-West, but from South-East. So Soviet AA cannons and fighters couldn't find the Germans. One more huge night raid on Moscow (100 He111s in two groups: 83 + 18 bombers, 5000-7000 m) - night 10/11 August 1941. Only 12 He111s reached Moscow because of AA fire and bad visibility, 5 of them - directly the center of the city (Kremlin, etc). All bombers dropped 49 high-explosive and 14000 fiery bombs on Moscow, suburbs and villages near Moscow. Two Russian aircraft factories were damaged in Moscow that night. The last raid on Moscow with many bombers - 14 November 1941 (190 fighters + bombers). 55 of them reached suburbs of Moscow, only one Bf110 reached the center of Moscow, dropped 13 small bombs on the Central airfield. A very rare event took place that day - one Soviet Il-2 was damaged by Bf110 fighter over the Moscow and the Russian pilot landed Il-2 in the main street of Moscow (Gorky street). It is interesting that the Soviets used excellent camouflage in the center of Moscow with false parks, buildings, even Moscow-river was covered near Kremlin by huge plywood sheets of green colour, were fixed on barges. That is almost all, I found. 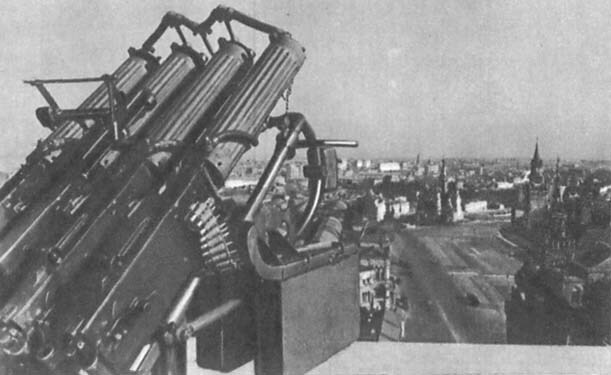 Does anybody have another photos of Moscow in 1941, especially AA defense (guns, balloons, fighters over Moscow)?